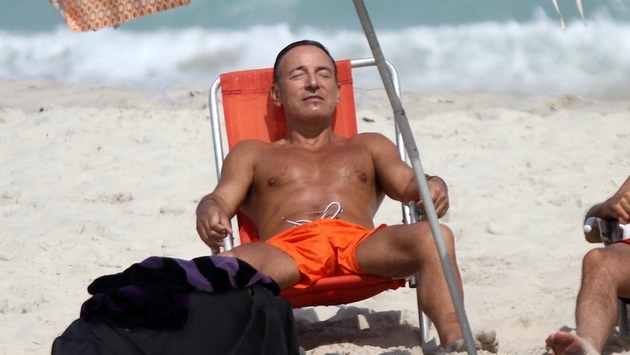 Bruce Springsteen, also known as "The Boss," was seen shirtless and soaking in the rays at Cottesloe Beach in Perth, Western Australia on Feb. 6. He appeared to be enjoying his day at the beach as he snapped a photo of the sunset over the shore. Sporting a black baseball cap, navy blue hoody, and white swimming trunks, Bruce was certainly prepared for a relaxing day on the beach. Earlier this week, the veteran musician said that his approach is to constantly change it up on tour. According to the Daily Mail, he said, "And even if you've seen many, many of the shows, there's going to be a moment when I surprise you, which is what I try to do." Bruce released the set list for his Feb. 7 concert on Twitter earlier today. The rockstar also said that this is his longest tour in decades: "I haven't done a six-week tour since ... I'd have to go back to my 30s. This is the longest stretch away from home ... for 20 years." Perhaps that's why his body looks so incredible.